The launch of Virgin Australia’s daily Melbourne-Hong Kong services on 12 November is a timely boost to meet growing demand for cargo capacity on the route, according to Virgin Atlantic Cargo, which provides long-haul international cargo sales and management for Virgin Australia. Volumes have been increasing steadily in both directions since Virgin Australia commenced five Airbus A330-200 flights a week in July. The extra capacity provided by the new daily service will support the peak perishables season ex Australia as well as thriving e-commerce and courier business from Hong Kong. Virgin Atlantic Cargo has generated over 1,200 tonnes of freight and courier traffic since the route began. Other regular shipments have included garments, shoes, electronics goods, vitamins, milk powder and meat. The appointment in August of Jarrod Paterson as Account Manager – Melbourne has also helped the airline develop other lines of business, such as shipments of fresh lobster, Abalone and chilled salmon from Tasmania to Hong Kong. Continued inward business investment in Melbourne is also expected to help sustain long-term cargo demand. Amazon is one of the latest global brands to announce fresh investment in the state of Victoria with its plans for a 24,000 square metre e-commerce fulfilment centre in Melbourne. Virgin Atlantic, which has provided long-haul international sales for Virgin Australia since 2009, also sells capacity on Virgin Australia’s operations from Sydney, Brisbane and Melbourne to Los Angeles. Shipments to and from Australia can also connect with Virgin Atlantic’s global network over both Los Angeles and Hong Kong. 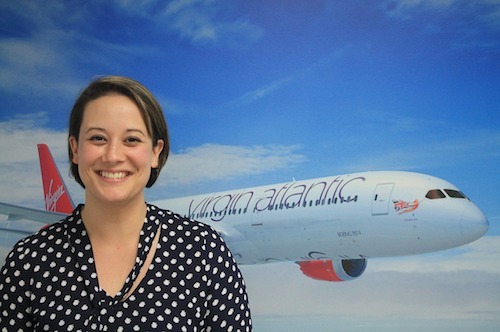 Image: Pip Palmer, Virgin Atlantic’s Regional Sales Manager, Australia and New Zealand.